I was not going to fly today. I had a tax deadline, tons of work, and I had to pick up Logan and a friend from school. But it was surely a terrible day to be stuck at home. Everyone was excited about a Makapuu downrange mission, and the French team were starting early. Thom called me when he spotted them over Olomana and gave me a turn by turn account, like a radio broadcast of a baseball game. Dave chimed in on the chat box. Finally they landed at the Waimanalo Rodeo, Thom drove out to see them, and I got back to work. It was a gorgeous day at Kahana too, but definitely very light, so I wasn't worried about being distracted by gliders when I looked out the window, at least until the Makapuu cross country crew blew by on their way to the north shore. But then Pierre texted me that Team Francaise were done flying Makapuu, and were now driving to Kahana. What? Why? I texted back that it was very light. He replied: great, we're on our way. Then I heard from my tax lady that the deadline was more flexible than I had thought. Hmmm. I might have to sneak in a quick one after all, before picking up the kids. I waited as long as I could, trying to be productive, and then finally broke down at around one o'clock and dashed out to see how the French guys were doing. Michel was up, scratching around the rhino horn, and the other five were on upper upper upper north launch, hoping for a cycle. The sensor said 7 gusting to 8, at 66. Pretty light, but frankly that's my favorite kind of day. I ran up regular launch and hucked off, confident that I'd show those guys how it's done. I got a few beeps and then headed over to buzz them, taunting them by saying "Come on, let's go!" Then I started to sink below the rhino horn, and had to buzz back below them on my way to the east ridge to try for a low save. I scraped my way up on the east ridge, slowly, a bit less confident now, and I think it took a good half hour before I finally got established above the ridge. Around that time the French group leader, Patrick Berod, multiple world champion and all around amazing pilot, threw himself off and started to climb his way up. He made it look pretty easy. Huh. It was probably blowing harder down there than when I launched. We circled together above Puu Piei in some sweet fat thermals, getting to around 2,700 feet. It wasn't north at all, but it was light, and I was wondering if it might be a good day to try crossing the bay. Patrick headed out before I could even suggest it, and I followed close behind. I guess great minds think alike! He came in quite a bit lower but it didn't slow him down, and we were soon thermaling up together above Hidden Valley in Kaaawa. Michel had landed by this time, and the other guys had hiked or sledded down. Above Kaaawa, I could hear all the action from Makapuu on the radio, including Mad Dog and Jorge who were racing along the Koolaus from Makapuu, on their way to the pyramid of Puu Ohulehule. Patrick wasn't on the radio with us, but somehow he knew the plan, and he soon started to track back into Kaaawa Valley toward the pyramid. I knew I had to follow, even if just to cross paths with the Makapuu guys. I had to be careful with my time, to be sure and get back to my car by five o'clock to pick up the kids. That ruled out a trip to Makapuu, but surely a little trip to the pyramid wouldn't take too long. Patrick went first and I followed. As we got to the back of Kaaawa Valley, arriving low at the base of the pyramid, Jorge came soaring into sight overhead. "Hello down there, Mr. President!" As we started to climb he raced past us and reversed the course we had just taken, getting up at Kaaawa and crossing to Kahana where he said he'd try and wait for me. Mad Dog made a gambit to cross the beginning of boogaland and reach the pyramid from directly behind it, but ended up getting flushed into Waikane. 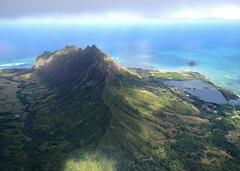 I watched him land down there, 18 miles from his start, and relayed his hopes for a ride to the Makapuu crew. Now side by side with me above the pyramid, at cloudbase, Patrick indicated that he wanted to fly around to the right and circle to the front of Kualoa. Wow! This was turning into the Tour du Kahana. I watched him blaze out on what looked like a sinky line straight into an obvious rotor zone, as I worked to get as high as I could before deciding where to go. Bonnie was driving her boat across the fishpond and said she was watching us and pointing us out to her passengers. I saw Patrick dive into the lee of the Kualoa ridge, super low, but somehow he started to climb out of there, riding the back of the ridge line up and around to the front. Now how did he do that? Come on, I know from long experience that there is violent rotor and sink on the leeside of a ridge. Or maybe the wind was just so light today that it didn't matter. Somehow I convinced myself to try it. I followed his line, coming in a bit higher, but definitely behind the ridge, waiting to be slammed down into the pastures below. But as I edged in closer, I started to feel some nice rising air, actually flowing in from behind me, and pretty soon I was riding a nice little thermal up, and up, and it was getting a little sporty feeling now, and I was almost high enough to punch around front, and then WHOOOOOSH! My wing fell behind me, and then WHOOOOSH! It dove in front of me, below the horizon, and I shoved my brakes below my waist to try and stop it. Half the wing collapsed and then it was back overhead trying to unfold itself, pitching and bucking, collapsing and sinking, and now that it was sort of flying, I changed course ninety degrees, directly away from the mountain. Oh My God! Now that was more like what I had expected. What made me think I could follow a multiple world champion into the leeside of a ridge??? But even limping out on a wide line, somehow I had just enough height to pull around front and scrape my way up to join Patrick, now happily skying out and boating around above the ridge. After a while he headed down to the park to land and get picked up by his crew, and I made my way back to Kahana to see if Jorge was still waiting for me. Turns out he'd decided to continue on, and had landed at Hukilau, 29 miles from his start. Duck was driving below and offered to chase before he had to leave for the airport. I could hear Maui Doug on the radio charging from Makapuu, taking his time, dodging rain clouds, and getting close to the decision point near the pyramid. I got high at Kahana, just as Kevin was launching into very light cycles on the east ridge. I had a bit less than an hour left before I had to be on the road, but I really wanted to join Jorge at Hukilau. Could I make it there and get a ride back within an hour? Only with a prompt and dedicated driver like Duck. I blazed over to Punaluu, getting high as quick as I could, maybe 2,700 feet or so, and then shot straight to Hukilau without turning, only slowing down a few times when I felt like I was in some boaty air. I landed, 7 miles from my start, but 17 miles along the whole tour. Or as we say in France, 27 kilometres. I folded up fast, just in time for Duck to shuttle us back. I was just barely going to get back in time to pick up the kids. In the car, Jorge told me the story of his flight. With Mad Dog following a short distance behind, he'd flown straight from a nice thermal in front of Puu O Kona to Olomana, catching a nice one there which drifted him directly to the Pali. He never worked the mountains, never went to Green Walls, but just worked his way up over the valleys, catching flat land thermals and making his way on a line out front to the pyramid where I'd seen him fly over me and Patrick. He got to three grand over Sacred Falls, but found nothing at all after that and landed at Hukilau. It was his longest flight but he'd had hopes of thermaling his way further, towards the north shore. I know one day he'll do it! Duck and I offered some input from our many downrange trips from Kahana, but really, so much depends on what kind of day you get. We got back to Kahana and I saw Bonnie there just before I jumped into my car and bailed - I hope you got a flight, Bonnie! Later I heard that Maui Doug had started into boogaland but got chased out by the rain, ending up at his kite park in Waiahole, 17 miles from his start. Duck drove Jorge to Waiahole on his way to the airport, and Dave came from Makapuu to bring them back. I blazed by on my way to pick up the kids. On the way home with the kids, I got the Makapuu report from Thom. Lots of pilots had been out there: Mike the Romanian, Ken Berry, Five-0 Mike, Andrew, Frank, Jim, Thom, Tommy RD, Dave, Don, Michigan Wayne. Thanks to Patrick for a great lesson in French style cross country flying. The Tour du Kahana! See you guys the next time you come to Hawaii! Thanks to Duck for the just-in-time retrieve, and for the delicious beverage. Have a safe trip to San Antonio and we'll see you on Friday. MPU crew also included TommyRD who is totally mended and back in action. Great write up again Alex I am planning the morning commute have rug rat duty at 2. How did that guy go lee side and not get whacked or did he and it was not noticeable?